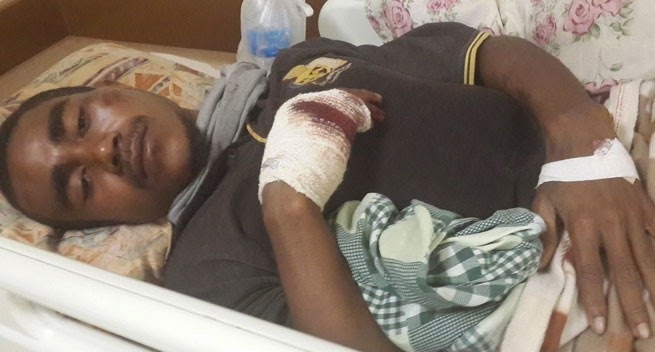 VILLAGERS from Kamali in the Central Province have become unfortunate victims of police brutality when they were attacked last Sunday. Councillor Alla Ralai, who visited the Post-Courier office on Monday with two others from his village, said earlier on Saturday a truck belonging to the L&A Construction that had been transporting bricks for their church building had got stuck in a stretch of road towards their village and other Rigo coast villages. "We received word that the truck was stuck so we went over to help pull the truck out of the bog with two tractors," Mr Ralai said. "Some villagers carried some bricks across to the other side of the road whilst our men were working through the mud trying to make a way for the truck to drive through." Mr Ralai said they worked until the early hours of Sunday morning when a 10-seater police vehicle drove by and also got stuck in the muddy road. He said when they wanted to help pull the 10-seater free, a young man protested that they should try to free the truck first before the police vehicle because they had been working since Saturday. "After we helped them, the son of a Sergeant attached with the Central Highway Police who had been travelling on the police vehicle came out and kicked the young man who had protested earlier. He also pointed an M-16 gun at the young man and cocked it," Mr Ralai said. Chairman of the Kamali United Church, Vele Kila said when the other young men from the village saw what happened, some rushed at the Sergeant’s son to hit him while others were trying to stop them. "In the midst of people rushing here and there, someone must’ve punched the Sergeant’s son but we did not see who did it," Mr Vele said. "We apologised to him and told him that he should come later in the day to our village so we could do something like bel kol to show that we were sorry for what happened," Mr Vele said. Mr Ralai said after they had freed the truck loaded with bricks, the truck continued on for Kamali village. "On the way, the truck was stopped by police officers, with the sergeant, who is from Kalo village who was informed of the incident. Gunshots were fired and everyone who was on the truck ran away. "A young boy named Wutuma Kila, a Grade 7 student, was hit on the head with a brick whilst the driver was assaulted and beaten up. The tail lights of the truck were smashed, the safety stickers removed and the key was taken away," Mr Vele said. "They continued to where we were and said to arrest Mr Ralai. Again everyone got scared and ran away but those of us who remained got beaten up." Mr Vele said the sergeant told him that, ‘I’m going to kill you. You beat my son so I’m going to kill you’ before firing a shot on the ground between his legs. "We were all villagers there and deacons but they treated us like criminals. Instead of asking us who instigated the fight, they beat us up. No one is above the law," Mr Ralai said. "They also beat up a teenager, Piti Porau. The sergeant fired five gunshots at my tractor and pierced the tyre. We have the shell casings as evidence of what had happened. His son also destroyed the lights and generator we had set up to work on pulling out the truck from the bog," he said. Wutuma Kila and Piti Porau were taken to Port Moresby General Hospital for treatment. disturbing and appalling to even consider the people wearing those uniforms as the force of the law. Their job is to help the people follow by the guidelines of the law. yet many take situations into their own hands, acting above the law. hypocritical. Is justice even served? PNG there is one problem that is taking our country nowhere. That is, Attitude. When we start to change the way we think and behave, maybe there is hope for the better. otherwise ba yumi sa wokim kain pasin olsem na degradim name blo country na prolong our country's development. We should be taking pride in our heritage not discriminating or defying it. All we got to do is be humbled and Let God take control. Come on PNG, we are more than what we say we are. Let us prove ourselves and others wrong that PNG is the place to be.